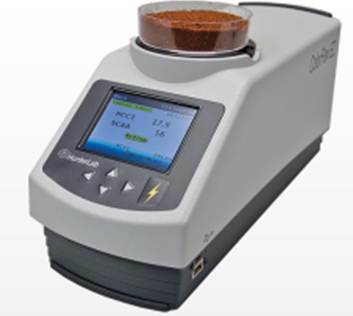 Recently HunterLab developed the ColorFlex EZ Coffee meter. The color of coffee is important because it is predominantly used to assess the degree of roasting. The CFEZ Coffee is specially designed to measure the color of roasted coffee grounds, freeze-dried coffee, and instant powders. Specialty scales have been added to the CFEZ to help easily determine the quality of the coffee being measured. These scales include the HunterLab Coffee Color Index (HCCI), SCAA (Specialty Coffee Association of America) Number, and SCAA Roast Classification. The CFEZ Coffee also now comes with a PQ (performance qualification) coffee tile. This tile allows the user to check the CFEZ Coffee instrument to ensure that it is reading color as expected. The CFEZ Coffee has been designed to consistently measure lot to lot differences to improve upon consistency and batch to batch production quality. By using the CFEZ Coffee it will be easy for to define the degree of roasting. The CFEZ Coffee gives users a quick and easy way to quantitatively determine the quality of their coffee.